In the heart of Dakar town-centre, 2 minutes’ walk from the Square of Independence. The Farid Hotel welcomes you with 30 rooms, all of them air conditioned for your utmost comfort. Each room also offers a nice bathroom, a phone, satellite television and radio sets, and a mini-bar. Room Info:wide variety of rooms available eg, single superior rooms and double superior rooms. Comfortable hotel and arranged well. Air-conditioned rooms, hot water and television. Surely a little too expensive, but environment "de luxe hotel '' with groom at the entry and the reception very pro are with go and the swimming pool is superb. 46, street Jules Ferry, in full downtown area, close to the cathedral. The street is calm and makes it possible to go quickly in the whole of the sites of the Plate. Bar and room of very convivial rest. Right in downtown Dakar, and close to the famous Place de l'Independence, the Hotel Croix du Sud -completely renovated, offers a real comfort in warm atmosphere . Hotel Lagon 2 enjoys an extraordinary location in Dakar right by the beach, offering a unique setting with a panoramic view over Gorée, the so-called Island of Slaves, and the Presidential Palace. Overlooking the Atlantic Ocean, this laid-back hotel is 2 km from IFAN Museum of African Arts and 4 km from both the Grand Mosque of Dakar and Dakar Railway Station. Cosy, air-conditioned rooms feature en suite bathrooms, free Wi-Fi and satellite TV, plus balconies and sitting areas with sofas. Room service is available 24/7. Faidherbe The hotel is at the "heart" of Dakar airport 15 km (20 minutes), pier for "Goree Island" 0.6 km (3 minutes), Independence Square 2.5 km (5 minutes), Great Mosque Dakar 1.3 km (3 minutes), Grand Theatre (5 minutes), Cathedral of African Remembrance, Kermel Market, Sandaga Market. Charming hotel in Dakar, capital of Senegal, Hotel du Phare is located at les Mamelles in a quiet and secured residential area named the cité des Magistrats where Judges have their residence in the outskirts of Dakar. 15 minutes from downtown – Dakar Plateau, 500m from the beaches and 5 minutes from the airport. 10 minutes from Night Clubs and restaurants. Ideally located between the Almadies, Ngor Yoff and Ouakam, ideal starting point for excursions tours or quiet rest. The hotel offers a full range of client’s services including full wifi, business center, Cable/Satellite TV. Ideally located in downtown Dakar, in a quiet area of the “Plateau”, discover “the Ndiambour Hotel and Residence”. Located in the centre near the business area facing the Atlantic Ocean and overlooking historic Goree Island. 5 min to Independence square and 15 km to the airport. Built in 1971, the Sofitel Teranga Hotel towers above the sea. This Hotel is located in the heart of Dakar, in the Business District, 20 Minutes from the Convention Centre and the Airport. La Citronnelle Restaurant Serves Both Local and International Cuisine, While the Assiette Au Grill Serves Char grilled Specialties by the Sea. Hotel du Chevalier de Boufflers is located right off the main dock on the isle, and is a charming red pastel building with a handful of African-decorated rooms. Goree Island is the famous UNESCO World Heritage site that was the horrible sending off point for slaves to the New World. It's now a somber reminder of this dark history, albeit with beautiful pastel buildings and cobblestone alleyways. One thing most tourists don't realize is that you can spend the night on Goree Island as well. Campement du Lion is situated in Kedougou, Senegal. The lodge is ideal for leisure and vacation stays. The rooms are designed with a double bed and en-suite bathrooms. Senegalese meals are served at the onsite restaurant, while drinks are ordered at the bar. Guests enjoy canoe rides during leisure hours. Campement du Lion is a 90-minute drive from city of Kedougou and a 60-minute drive from Tambacounda Airport. The Hotel de Paris is Blue Horizons Group of the Party since 2013. Completely renovated, the front of the frame, its 36 rooms and suites are decorated and equipped with powerful hardware, wifi, split, plasma TV and room service at all hours . A well built hotel conveniently located and having all the basic facilities. As soon as you arrive at Keur Saloum hotel-lodge, a breathtakingly immense and untouched landscape unfolds before your eyes.. You are in Toubacouta, Senegal, right in the middle of the Saloum Delta. Located at the edge of Kedougou the campement is directly situated at the river Gambia. The 8 cabins are typical Senegalese decorated. You will find a double or single bed, shower,bathroom, ventilator. Lodging offered, in perfect harmony with the life of bush, arises under the aspect of a African village (rooms of 2 or 4 beds, water room, covers, cloths, mosquito nets, electricity…). Kundam on the beach at the edge of the Saloum River, close to the city center, the Relais de Kaolack offers 48 bungalow rooms (air conditioning, hot water, satellite TV, telephone, wireless internet connection, telephone), and two suites. We also have two air-conditioned conference rooms, a restaurant, a panoramic restaurant and a lounge bar by the river. Mako lodge is located in a superb surrounding, by the river Gamboa. It is 35 km from Kedougou and 4 km form Mako.The lodge includes: 12 single huts 2 family huts (twinned) 1 4-room hut All our huts have air-conditioning, fans, shower, basin (hot water), private toilet. Wardrobe and drawers. 2 king-size beds. Towels. Laundry service. 220 v electricity. At Wassadou you can mix pleasure with nature and relaxation, hike on foot, fish or swim, or just simply try out one of many hammocks!! The hotel in the middle of the park Niokolo Koba. Magnificent view over the river, its fauna and flora. The exquisite 5 star Le Royal Lodge is set amongst 5 hectares of lush tropical gardens abundant with palm, baobabs and coconut trees, situated on the seafront, in the heart of the natural park of Sine Saloum close to the fishing village of Palmarin. The international Airport in Dakar is a 2h30 hour drive from the hotel. Escape to a little piece of paradise, where you are guaranteed privacy, luxury, and indulgence - look no further than the Le Royal Lodge. A magic place for dreamers, gourmets, aesthetes and thinkers. Experience unforgettable, authentic moments. The site has only 16 rooms, each individually designed to blend into the landscape and full fill your dreams. In a setting of greenery and tropical flowers, on the "Langue de Barbarie" between the Senegal River and the Atlantic Ocean, the Saint-Louis hotel has 35 rooms - among which 10 are duplex. At the magic place where Sahara, Black Africa and ocean meet, Saint-Louis was the capital of the French West Africa and preserves the tracks of her prestigious past. The famous Hotel de la Poste in Saint Louis, Senegal is one of the most well-known historic hotels in the country. The hotel dates back to when Saint Louis was a crucial stop on international postal routes. Famous aviators like Jean Mermoz stayed there in its heyday. Located in the heart of Ile Saint-Louis, Hôtel du Palais is undoubtedly the oldest hotel in the city. Now fully renovated, the Hotel du Palais has a pastry - tea room and all modern comforts. The Hotel Mermoz occupies an area of 2.5 hectares and is located 3 km from the centre of Saint-Louis on the "Langue de Barbarie", a narrow strip of sand between the Atlantic Ocean and the Senegal River. The hotel is made up of charming two-bed roomed bungalows, each with a surface area of 30 m2 and its own bath room. Situated as its name suggests at the southern tip of the Ile Saint Louis, the South Point Hotel has 9 rooms, 2 suites and 2 studios. The hotel is very new and the amenities such as furniture are impeccable. Thanks to its privileged position, discover quietly installed, your room or the terrace where you will have breakfast, a unique and breathtaking views of the Atlantic Ocean, the bustling activity of the fishing village and the majestic River ; change of scenery. Le Palmeraie in Saint Louis, Senegal is conveniently located between at the limit of the Sahara, in the Old Capital of French Western Africa. The Hotel, L'Oasis is spread out in a park of almost 2 hectares between the River and the Ocean, protected by its greenery: filaos (Senegalese pines), cordia, blazing, parkésonia, eucalyptus, acacias, hibiscus, bougainvilleas, bay-trees. In the center of this small paradise niche, the hotel complex is composed of 3 main and comfortable buildings of colonial style. Located in the district of Cité Niakh, in a green landscape, Hotel Mame Coumba Bang, with an authentic style and ethnic-inspired design, perfectly combines the feeling of relaxation and great escape. WiFi is available. Equipped with a private bathroom, a TV and a balcony, the rooms of the hotel will transport you into an atmosphere of softness and security. On the banks of the mighty of the Senegal river, The Ranch de Bango lies amongst shady glades of local trees and offers the perfect base to discover the dramatic landscape of Northern Senegal. Résidence Saint-Louis, Senegal offers the richness of its architectural heritage. Our hotel colonial charm is easily accessible from the airport of Dakar and offers quality accommodation on the island of Saint-Louis. A bar and restaurant are also available within the hotel. M’Boss Dor, exceptional site is a 5 ha private island lost in the mangrove swamp next to Sine Saloum National Park in the Palmarin community reserve.It’s a very natural small island, ideal for a quiet stay. You’ll come to us for the change of scenary, the observation of birds. If you’re lucky, you may even see spotted hyenas, jackals, servals, water mongooses, vervet monkeys, varanus, animals which we regulary see but that know how to be discret. An island… lost between sky and mangrove, wild, intimist, sophisticated, full of spell. With a stay at Hôtel Les Bougainvillées Saly Sénégal in Mbour (Saly), you'll be convenient to Saly Golf Club. This hotel is within the region of Mbour Fishermen Village and Bandia Animal Reserve. 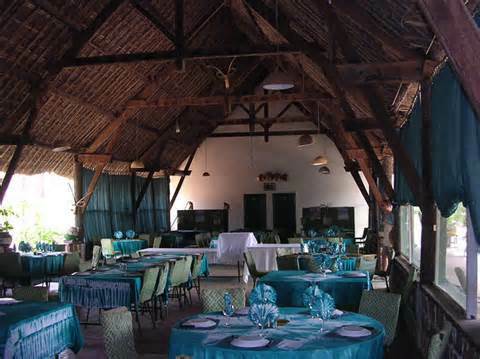 eur Maya is located on the seafront, in the authentic village of Niakh Niakhale in Mbour, Senegal. WiFi is available. The rooms have private bathrooms with shower, terrace and refrigerators. The hotel bar serves a wide variety of drinks and cocktails. A common kitchen is available for guests. Guests can relax at the pool or go to the discovery of the region thanks to the many activities and excursions organized by the hotel staff. Car rental, laundry and airport shuttle services and free parking are available. Les Flamboyants revolves around an outdoor pool with lounge chairs, surrounded by palms and tropical plants. It features water sports facilities, a nearby golf course and a hammam with massage treatments. Situated right on the sea, with direct access to the beach & marina, Le Lamantin Beach Hotel is a universe of well-being, in the heart of the beautiful touristic town of Saly. Constructed in a African style, the resort is composed of traditional freestanding huts offering luxurious amenities & purely traditional Serere décor. At the very heart of the famous Saly sea resort, NEPTUNE HOTEL welcomes you in a luxurious tropical garden. Saly has been created next to the fisher village of the same name. In spite of growing tourism, the originality of this village has been preserved. With a stay at Blue Africa in Mbour (Saly), you'll be minutes from Saly Golf Club and close to Mbour Fishermen Village. This hotel is within the region of Bandia Animal Reserve. Palm Beach, located at Saly Resort in Senegal offers all the assets for successful holidays: tally pleasant, comfortable rooms, French/English speaking and cordial reception, good table, varied and many activities. Accommodation at the Residence Paradis, is both ample and comfortable. You have the choice of staying in quaint bungalows scattered across the beach or apartments for larger apartments. Amenities include TV, telephone, en suite bathroom, air conditioning and self-catering units. You also have access to a swimming pool, a restaurant which serves delicious cuisine, a bar to cool yourself off with at the end of the day and rental cars at your disposal if you want to take in the sights. Destination of dreams, located on “the Small Coast” at Saly, Senegal, at the edge of a splendid beach bordered of coconuts, the ROYAM HOTEL, 4 stars, will allure you by the quality of its reception and its services. The ROYAM HOTEL will allure you by a typical architecture, a cordial reception, an irreproachable service, like by its private fine sand beach, its gardens and its splendid swimming pool of fresh water. Located in the Saly resort, at 80 km south of Dakar, are two twin hotels wholly dedicated relaxation, leisure but also for meetings and conventions. These two hotels share leisure equipment: fresh water swimming pool, fit out beach. A wide range of water and land sports are proposed in the hotels or with our partners. Picture a lost isolated beach, facing the Atlantic Ocean, where it is possible to spend a couple of nights with your significant other, your family, your friends away from everything, with your own chef and your own waiter for an unforgettable meal in a pristine environment. At the heart of ZIGUINCHOR, located in front of a majestic scenery along the river Casamance, hotel Kadiandoumagne, scored 3 stars, is a modern hotel. The garden and pool ensure calm and serenity.